I don't know who's more excited about Lisa finishing hooking her first rug.... Lisa or me? When she came to me back in April of this year she had no experience hooking whatsoever! Lisa loves primitive's and fell in love with this rug she spotted online and was bound and determined to learn how to hook one for herself! Somehow she stumbled across my blog and learned that I gave rug hooking lessons here in my studio. 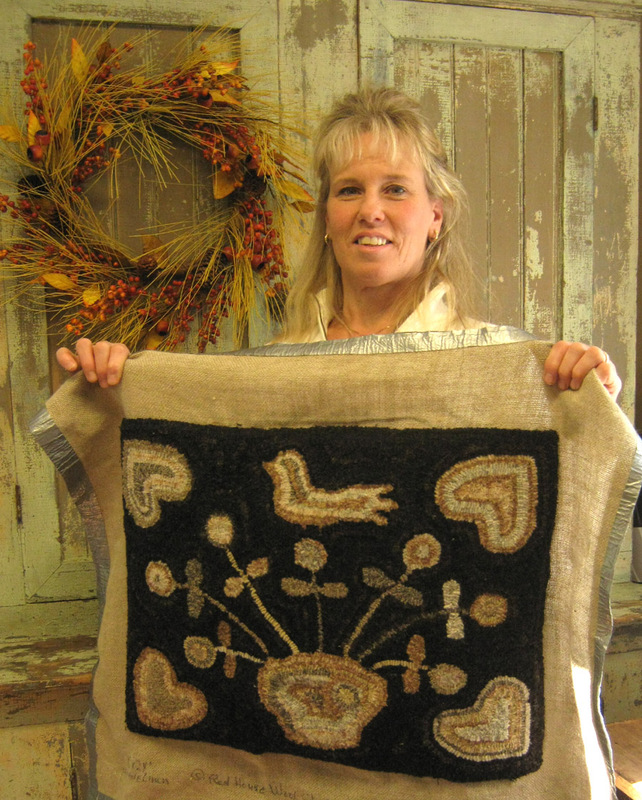 After getting a good start on her rug Lisa had to put it on the back burner for awhile. Her daughter was married this summer and the wedding was held among the beautiful gardens of her home. Farming, raising and showing horses, two young sons and driving the US Mail truck daily kept this energetic gal busier than usual! Then a few days ago she called to say she was done hooking and needed help with binding! We decided to go with a nice wool binding in black. I am really loving this rug! Every loop has determination, learning to overcome obstacles, love for the craft of rug hooking and the desire to have something made by ones own hand hooked right into it! Lisa will tell you how much reverse hooking she did..... a perfectionist at heart! Then she realized how wool is a tender loving material to work with and that in the final product those loops that weren't perfect in her eyes became the character so sought after in primitive rugs! So Lisa when you read this...... know that it was a pleasure to help you on your way to learning how to hook rugs! I am so very proud of you that you kept on going and finished your very first rug! It's a beauty and I can't wait to see what's going on your frame next! !